Complete at checkout and receive a decision in less than 60 seconds. Will a credit check be performed?Yes. DivideBuy uses a third-party credit reference agency to perform a credit check. This is used in combination with your entered details and our own unique algorithm to assess affordability. Will I have to pay a deposit?Your first instalment is payable on completion of your order. In some instances, you may be required to pay a deposit based on a combination of your credit score, size of order and number of instalments selected. How many instalments can I Spread the Cost over?Depending on the total value of your order and the Retail Partner, you may be able to Spread the Cost up to 12 monthly instalments. 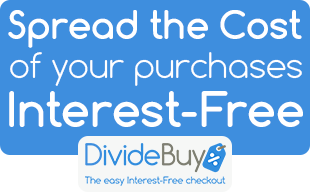 What happens if I want to end my agreement early?DivideBuy offers the option to repay the remaining balance on your account at any point with no additional charges or fees to pay. You can do this by logging into your DivideBuy account on our website or by calling the Customer Service Team on Customer Service Team on 0800 085 0885. Instalment Plans are provided by DivideBuy (DivideBuy is a trading name of Rematch Credit Limited, company number 08097204. Credit subject to status and age. Terms & conditions apply.